This apprenticeship is made up of both college and work-based learning. With the support of a training provider units can be selected to create a tailored training package suitable for the required role. I am overjoyed that I have been selected for this unique apprenticeship at this stage of my life. I have been dedicated in finding the best route to a career in Fashion. The timing feels like destiny. I look forward to learning & working hard. Thank you! The first company I worked for was not legally complaint and FTA fully protected me. I would recommend an apprenticeship to anyone who wants to work hard at achieving - it's all about the effort you put in but you can make it! Just never give up. 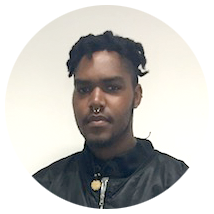 After completing the level 3 apprenticeship programme FTA found me the perfect role at Darling London as an assistant designer. I recommend the apprenticeship programme over uni as I find the fashion industry is all about experience & the people you meet. Every day is different and I meet loads of people. Uni wasn't for me but this apprenticeship is right. One of my highlights so far was winning an award for commitment and dedication and I got to meet Alex Pritchard player for Tottenham Hotspur. From Stitching Academy Level 1 to June Sarpong’s apprentice, Tehia has excelled since enrolling with the FTA.